The President of Ireland, Michael D. Higgins, said that the EU needs to embrace diversity and promote social cohesion. 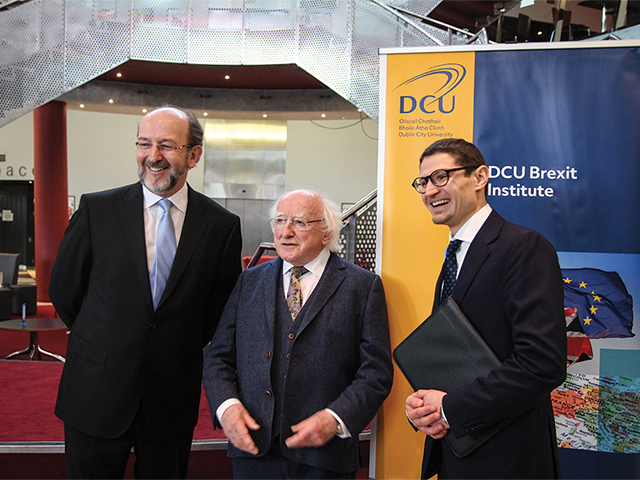 Speaking at the launch of the DCU Brexit Institute, the keynote speech by Mr Higgins focused on the need for politicians to dissent against the division of people due to religion, race and nationality. “In the absence of an adequate and inclusive discourse and emboldened by those who seek to mimic the language of the far-right for short-term electoral advantage, these political forces – exploiting and drawing on the despair, alienation and anomie of citizens – seek to divide us against one another on the grounds of ethnicity, religion and nationality,” he said. He said it is imperative that the EU draws on this diversity and uses it as a tool to rebuild the union. “What matters now is whether the project of European integration is capable of drawing, or willing to draw on this diverse array of institutions, and in its project of integration be sustained and enhanced by recognising diversity, and whether such an integration can meet the demand for social justice and social cohesion,” said the President. The conference was also addressed by the Chairman of the UK House of Commons Committee on Exiting the EU, Hilary Benn. Mr Benn said that, in order to prevent future states leaving the EU, the Union should ask itself why they lost one of their member states. “But it will be for European citizens, the ‘European Street’ to decide, and in making that choice I hope the EU will, at some point, pause and quietly ask itself how it came to lose one of its most important member states,” he said. The British MP said that it is ‘astonishing’ that Britain has not decided on its relationship with the EU, 19 months after the referendum. “We are two-thirds of the way through the process and yet we haven’t even yet started negotiating our future relationship with the European Union. It is frankly astonishing,” Benn added.